It was a lovely day, and Jules and I decided to go for a long walk before attending a lecture. 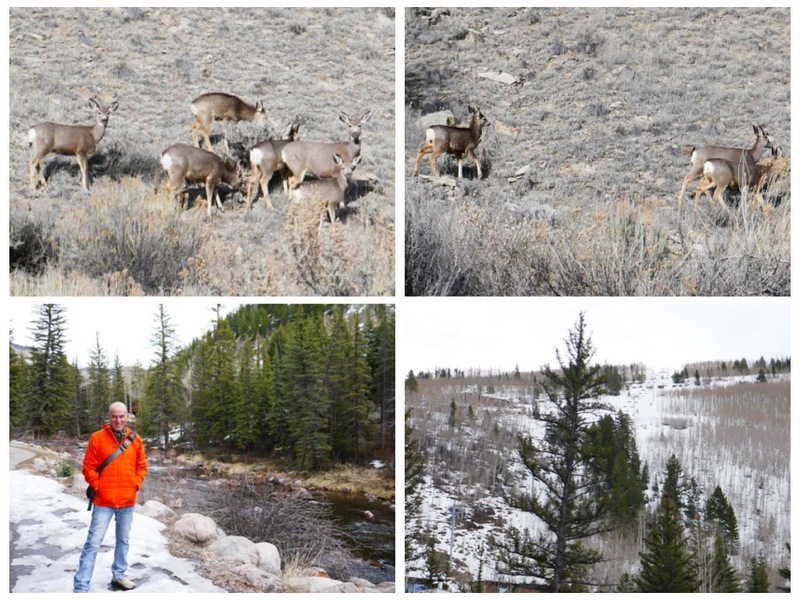 We dressed warmly and took a two hour walk along the river in Vail, Colorado. It was a slow walk, as some of the paths were still covered in snow and ice. We observed many different birds who were enjoying the early spring weather, and admired the river dams built by industrious beavers. When evening fell and the sky turned a beautiful golden hue, we gathered at a small auditorium to listen to Erik Weihenmayer, a blind man who had overcome so many barriers and obstacles, to lead a full and adventurous life. The auditorium was packed to capacity with more than two hundred people, and there was even a waiting list to get in. So many people wanted to be inspired by someone like Erik…. I was struck by how humble and ordinary Erik looked, while being such an extraordinary man…. He walks with a blind’s man stick, and despite being an amazing mountain climber, a skier, and a level six river rapids kayaker, he is not ripped with rounded bulging muscles. He looks ordinary, but with an extraordinary inner drive and wisdom. Sitting in the front row, I could feel how humble and vulnerable Erik truly is. People often mistake good and powerful abilities that naturally lead to confidence, with arrogance. I felt sad when I remembered recently being told that it might sound like I feel that I am better than others, when all I did was to speak with confidence about my own experiences and knowledge, that I have discovered by going on my own expeditions and doing my own experiments. But the funny thing is that I rarely feel self-confident. Most of the time, I feel vulnerable or at least completely open to learn, without any preconceived ideas about what to expect. I find that in life, when taking big chances or undertaking big challenges, it is best to be humble and vulnerable, and to listen to the wise inner guide within. My small self can know nothing and has every reason to be humble, but my Higher Self is connected to the Universal Wisdom and can guide me. Life humbles us very often and reminds us of our limitations, but we do not have to stop at any barriers. He spoke about losing his sight at the age of sixteen, but instead of allowing this terrible setback to be the end of his active life, he took a rock climbing class that opened his horizons to new possibilities. Erik was the first blind man to climb Mount Everest, and at the lecture, he showed us slides of that expedition. We saw how he walked over wide crevasses on ladders, putting one leg after the other while wearing snow hiking boots with crampons, a task that is hard and terrifying to do even when you can see where to place each foot. We saw clips from his recent expedition, kayaking down the Colorado River in the Grand Canyon, flipping into raging rapids and riding over small waterfalls in his solo kayak. Erik said he had trained for six years in order to do the Grand Canyon expedition. Erik also showed us clips from a documentary film about how he and a blind woman from Germany took blind Tibetan and Nepali kids hiking and mountain climbing, helping them to overcome superstitions and societal neglect, to be able to live full and independent lives. Erik showed us photos of his son, whom he adopted from Nepal, and friends of Erik read to us chapters from his recent book. Erik also has a great sense of humor, and he made us laugh when he told us stories of meeting other blind climbers on expeditions and helping people overcome their fears and serious injuries to lead full and exciting lives. Where we are blessed to live in Colorado is an outdoor Mecca for adventurous souls. I was afraid people might ask Erik meaningless technical questions, like what brand of shoes he wore while climbing Everest, or what brand of kayak he ran the Grand Canyon rapids with, but people did not. Instead, they asked him about how he overcomes his fears, and whether he thinks that because he could not see the deep and scary crevasses that he walked over, was he possibly less scared than those who could see and thus could imagine falling, and multiply the dangers of the climb. Erik calmly reassured us that everyone has fears. You can either cave in to your fears and lead a small and fearful life, or you can stretch and do the things that make you grow. When engaging in outdoor adventurers, every advantage you have, like being able to see, is helpful and will no doubt make you less fearful and a little more confident. Erik also showed us slides of some of his friends, with whom he had done incredible rock climbing. One man, who is completely paralyzed from the waist down because of a previous climbing accident, had to inch himself up the steep cliffs by using only his arms. This man has created a device that allows him to pull himself up by a pulley, just a few inches at a time, taking many hours to climb up a three thousand foot rock wall. Erik said that at the top, his friend was completely scratched and bleeding from inching himself up the rocky cliffs, but he was so optimistic and joyful. I was thinking about how he would still have to make his way down the same path as well…. Erik said that the irony of being on the mountain top with two of his friends, was not lost on them. Erik said that he was NOT a daredevil. He was not out there to risk his life nor to prove something to society. He simply loves the outdoors and loves adventures like all of us, and he was not about to stay at home and feel sorry for himself, just because he cannot see the world. as well as a husband and father running a non profit organization that helps other people with disabilities all around the world to live wonderful lives. I could relate to everything Erik said. Although I do not have any physical disadvantages, I do have my own worries and concerns that at times limit my choices and stop me from celebrating my wonderful life with full gratitude. I am determined to do better….. to be more grateful, to stretch myself beyond all fears and to move forward with a “blind faith” in the GLORY OF LIFE, to live my incarnation to its fullness with gratitude and joy. I am adding to this post photos that I took in Colorado. Some I took in Denver, Carbondale, Vail and Aspen.